These still "class up the joint." One now serves as a Y.W.C.A. after almost 70 years as a church. The other two are abandoned for now. Architecture tourists can learn something from these. But as your know-nothing host, I can only ask questions. Are there similar buildings in the Atlanta area? What are the precedents for buildings like these? Where do public landmarks belong? This quote from Jane Jacobs rings true to me, a partial explanation of why some of our streets are beloved while others are bores. The 1930 Lizzie Chapel in Inman Park is the least detailed. Though abandoned and surrounded by many of Atlanta's best Victorians, I like it every time. Broad shoulders, ionic columns in antis, pediment, attic story. I can imagine the life this added on Sundays, and Wednesdays, and for big Saturday weddings in it's heyday. The arms if the "I" aren't pronounced but there they are. 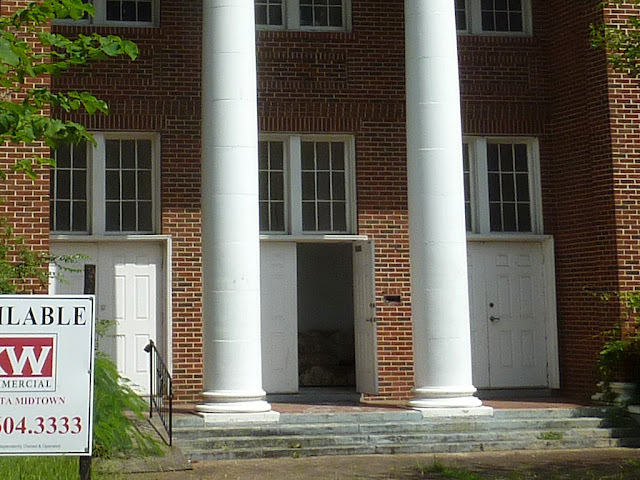 The pilasters suggest another recessed portico. The 1924 First Associate Reformed Prebyterian Church was re-purposed as the Northeast Intown YWCA in 1991. It's active 7 days a week. (Re-purposed churches from SacredPlaces.org). Columns in antis, massive entablature, a suggestion of a gable, fine steps for people watching. I think Highland Avenue strollers get a boost every time they pass. I do. It may be stretching to call it an "I." It's a capital "T" or wobbly "H." Fine work by Surber & Barber Architects and Carter-DeGolian General Contractors kept this building vital and flexible. I wonder what those tall sanctuary windows were like when it was a church. 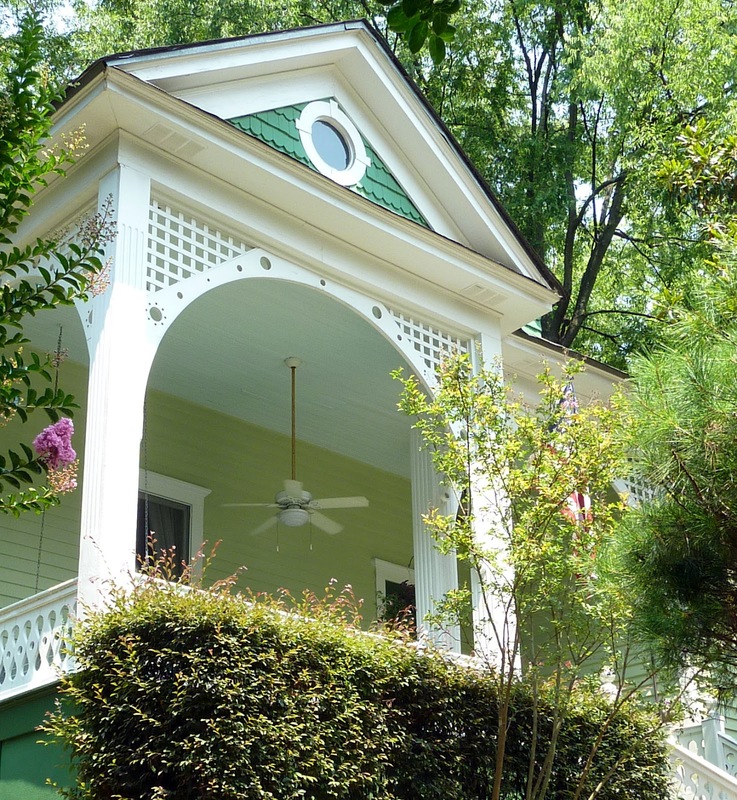 You might be interested in the National Register of Historic Places Registration Form for the Virginia-Highlands Historic District. 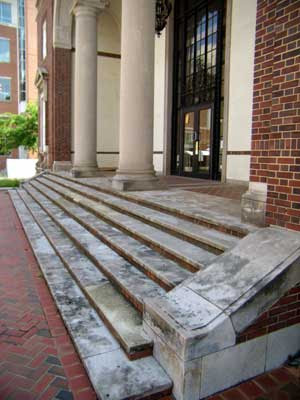 The 1926 Crum & Forster Building by Atlanta architects, Ed Ivey and Lewis Crook was an office building. It's abandoned, owned by Georgia Tech, and at risk. The details are Italian rather than Greek but the portico and the "I" are there. I think this is a fine building but I haven't fallen in love with it. How well does it serve as a public landmark? Last week I blogged Lizzie Chapel in Inman Park, this week it suffered a tagging. 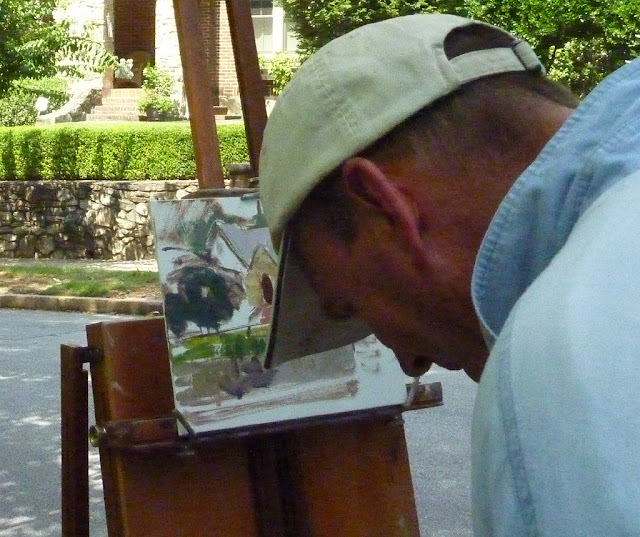 I spotted a house painter on Pelham last week, fine art house painter, Charles Cashwell. I doubled back so I could introduce myself and see the work. It was about 4pm and it was hot, he was camped out in the shade. Charles said he was struggling to capture the light, the colors and textures in the light. He was doing far better at it than my camera. Our portrait model is from 1930, 82 years old. Pelham houses look like this. They aren't big but a bit bigger than average for Morningside. Most were around 2,500 square feet when built. I've driven past hundreds of time. It wasn't until I stopped and looked over Charles's shoulder that I looked closely. Charles Cashwell also does human portraits and landscapes. By Heather McPherson, Get this Gallery. ATTENTION Architects, Designers, and Realtors:: Your clients will treasure their house portraits. I noticed the door was open. I knocked, poked my head inside, and they let me have a lo0k. I've been driving by the intersections of Euclid, Edgewood, Delta, and Druid Circle forever. I've been hoping to see inside. Though it's in the midst of restored "grand dame" Victorian houses, Lizzie Chapel - even gone to seed - still holds its own. It's welcoming in a way no private house can be. And if it's raining, we can duck under the portico. I talked with Carolyn at the Atlanta Preservation Center. She said a congregation met there as late as 2005. She thought it had burned twice, the windows aren't original nor were the insides. I wonder if the Macon Lizzie Chapel is the mother church of ours in Inman Park. The pews are gone. Original or not the windows are beautiful. The space is in mid restoration. Why, I don't know. It won't be a church again. Too bad I think. It's freshly painted waiting for finishing touches. This is the view from the choir about noon. Ample balcony, no hiding from the preacher up here. The windows are minimal but big. I wouldn't call this minimal, exactly. The baptismal looks relatively new. Is this a fire repair? Sharon sent me this post card from between 1930 and 1945. There is still a First Alliance Church in Atlanta. It's on Druid Hills Road, I pass it every week. So I called them. It is the very same church. In fact they still have a member who attended in Inman Park. Maybe we can find out where Lizzie came from. Their history in Atlanta dates back to 1899. They built their Inman Park church in 1930 as the Atlanta Baptist Tabernacle after the former Tabernacle on Capital Avenue burned. They moved from Inman Park to their new Druid Hills church in 1964. They know nothing about the Lizzie Chapel name. That must have come after they left the building. I couldn't see the cornerstone very well. What I can see is confusing. It's discouraging that someone removed several names. I know the Pharaohs did that sort of thing. The First Alliance Church folks told me they'd been contacted recently because developers were considering tearing Lizzie down. But tearing it down will be tough for many reasons. It's a contributing property "...any building, structure, or object which adds to the historical integrity or architectural qualities that make the historic district, listed locally or federally, significant." Developers are trying to re-purpose it to residential. It's certainly a challenging project. I wanted to see inside and got more than I bargained for. It's raised enough questions for many more blog posts. "You are correct, the kiosks in the photos were installed in late 2009. The management, leasing and upkeep of the kiosks is handled by a contract that the City of Atlanta has with General Growth Properties a retail/mall management company. The program has had some challenges and is currently being debated by City Council about how to proceed." Atlanta's 1996 Olympic kiosks are still here. As pretty as they are, I wish we could find them a nice home, somewhere else. I don't spend much blog time complaining. I hope you'll excuse me this time. 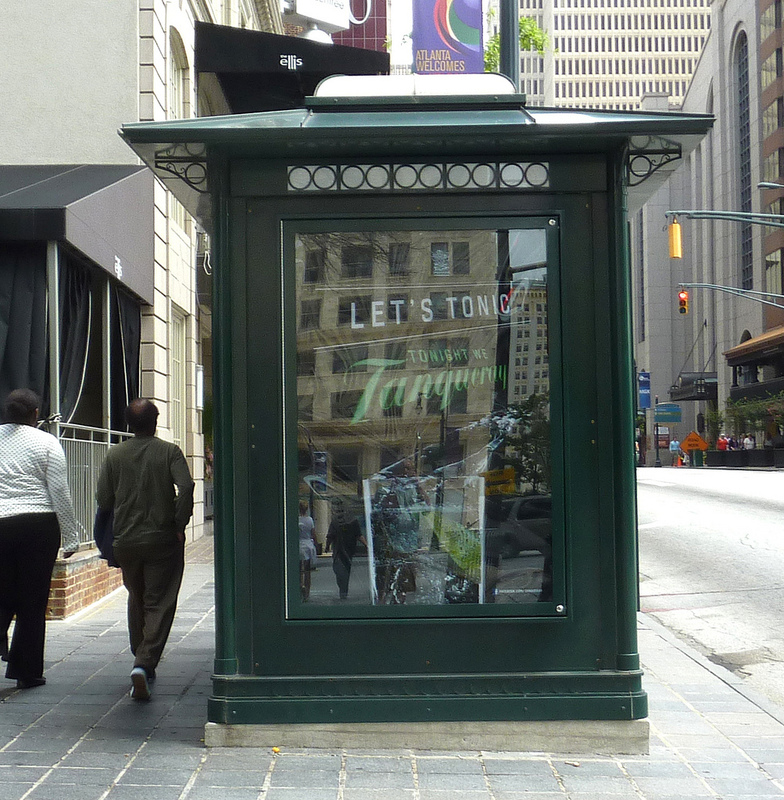 Here we are at Peachtree Street and Ellis Street looking north. I walk past here 4 times a week. It's pretty, it's well kept, it's solid and sturdy. It's blocking the sidewalk and blocking my view. Is it open? No, but you certainly can't tell from here. Is there someone on the other side waiting to mug or panhandle me? You can't tell from here. Is it scaled for human comfort? I think it mocks puny humans. Can I see all the wonderful Peachtree sidewalk life? No. Can I see the zen view all the way through SONO to Midtown? No. Can I see the parade coming, or going? It's a bad experience for the operator: She can't see north, she can't see south, she can see east. She has a narrow field of view facing a wall. Potential customer whiz by; they don't even know your are open until they are right there. It's a bad experience for the customer: You can't tell it's open. You don't comfortably approach a person from a distance. You go from not seeing the operator to seeing him for the first time from a few feet away. It's a bad experience for the pedestrians. I am not against street vendors or kiosks. This one is a few few blocks north. Let's re-purpose the kiosks and and find them a nice home somewhere else. Let's find a way to liberate Peachtree. And let's hold in those tummies while we're at it. My impressions: 5 open houses in early July. I don't usually get to go inside: Grant Park, Druid Hills, Candler Park, Virginia Highlands, and Morningside, from 1920 to 2012. I think architecture tourists deserve curated lists of open houses. I mean: We aren't buying but we are certainly in love. On July 1st, I visited this 1920 Victorian overlooking Grant Park. It's as perfect as a 90 year old smallish family house can be. In the early 70's this house was probably falling down. You could have bought it for a few thousand. It's pretty close to the house next door but they do have this nice stained glass window. With a 12 foot ceiling in the central hall and with parlors right and left, you feel like you are in a museum. The bathrooms and kitchen are up to date but they don't do houses like this any more. And maybe that's a good thing. But someone will fall in love. Maybe JoAnn and I would have in an earlier era. In the meantime I have a crush. On the 8th I did 4 houses. I just cruised looking for balloons. I hoped to find one in Inman Park. Who knows what you'll find in Inman Park. But Chandler Park is just fine too. This had me at the driveway. In fact this was an architects house. Too small for their family they moved away and rented it for decades. Then a tree smashed it. They added an upstairs and put it up for sale. It's a 1930 bungalow updated with clever design and oodles of hand made details. It's a charming bungalow in the front, modern-practical in the back, Funky fun done well. I smiled the whole time. I think I could live here. It's a 1929'er with a big garage/maids quarters/ student apartment in the back. Several Emory VIP's have lived here. It's elegant and beautiful but not a mansion. I felt important when I walked into the central hall with very fine if not overly grand stair. The dining room is to the left, great parlor to the right exactly as expected. It has some add-ons, some enclosures, and a new kitchen. There was no funkiness so I wanted modern closets and I wanted a kitchen/family room combination in this one. But I could live here none-the-less. This is a 2006 teardown. It might as well be brand new. It's a lesson in maximizing a 50' wide lot into 4000+ square feet and a 3-car garage, The left door can park cars 2-deep. There are a bunch of these in Linwood Park. It fits the modern checklist for kitchen, bathrooms, closets, interesting ceilings, family room, elevator, and space, space, space. It's a city house. But the double garage in front keeps it from being a Virginia Highland house. This is a 1940'er renovated into a brand new house. It's absolutely in keeping with the neighbors. Very clever design meets the modern check list in a minimum of square feet. And there's no climbing to bring the groceries in. It's in a very desirable location. Though it's a renovation, it feels as if it's been designed from scratch. I could live here. That's five down, and thousands to go.